Analysts with one major ratings agency lowered the credit scores for a dozen hospitals and health systems between April and June, an increase from the prior three months, a new Moody's Investors Service report said. The ratings agency also raised credit ratings for 12 hospitals and health systems during the second quarter after upgrades spiked in the first quarter to 15, surpassing the number of downgrades (eight) for the first time since the final months of 2005. The reversal was expected. As Moody's released the favorable upgrades and downgrades for the first quarter, analysts cautioned the positive ratio would not hold up as a result of the struggling economy and pressure to curb healthcare spending. Analysts said the equal number of up and down ratings in the second quarter may indicate a “small window” of calm after the credit crisis and ahead of health reform. Moody's cited the weak economy, poorly performing operations and fewer patients among the reasons more healthcare borrowers saw ratings drop between April and June. Troublesome debt also contributed to downgrades last quarter. Debt weighed on ratings for Albert Einstein Healthcare Network and two strongly rated credits: Scott & White, Temple, Texas, and Greenville (S.C) Hospital System. Plans to increase its debt threefold (by $315 million) prompted Moody's to downgrade Albert Einstein, a 701-bed hospital in Philadelphia, to Baa1 from A3. Scott & White, lowered to A, recently borrowed roughly $346 million to finance four renovation and construction projects, including a new 140-bed hospital. Analysts reduced Greenville Hospital's credit to A1 after a recent deal to sell then lease physician offices weakened its balance sheet once the operating leases were treated as debt. 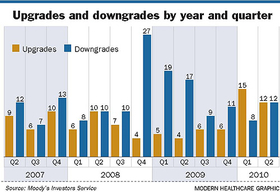 Still, last quarter's tally of downgrades is moderate compared with the 27 downgrades in the last three months of 2008 and the first two quarters of 2009, 19 and 17, respectively.